Sixty-something cat shelter volunteer Lynley Cannon always finds more trouble than a cat in catnip, but this time it's not about her. 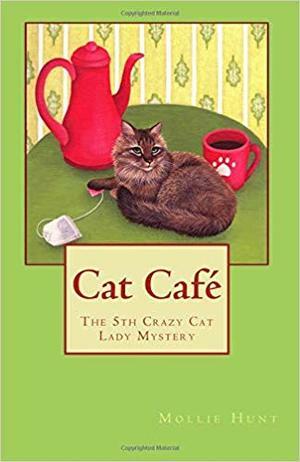 Someone is targeting very senior citizens, and when Bea Landrew, elderly owner of the Blue Cat café turns up dead, Lynley's mom Carol could be next. Handsome Detective Devon is looking for a link between the victims when he makes a different sort of connection- with Lynley! It's been a long time since the cat lady had romance in her life, but while her mom is in danger, the case comes first. It appears the cat café will go the way of its deceased owner, but Bea's grandson, a slick Miami businessman, steps in at the last minute. Arthur is not a cat person so why would he bother? Romeo, the big Russian Blue, senses ulterior motives, but who will listen to a cat?A black cat rescue, a discovered photograph, an elaborate payback. Is this killer seeking justice or vengeance? With death as the objective, the results are the same.